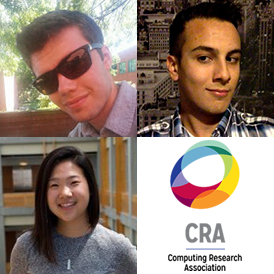 Carrying on UW CSE’s tradition of excellence in undergraduate research, three students — Christopher Mackie, Nathaniel Yazdani, and Sarah Yu — have been recognized by the Computing Research Association as part of its 2017 Outstanding Undergraduate Researcher Awards. Since the year 2000, 55 UW CSE undergraduates have earned accolades from CRA for excellence in research — more than any other institution in North America. Mackie and Yazdani are members of CSE’s Programming Languages & Software Engineering (PLSE) group. Mackie, who is studying Computer Science and Physics, has been working with professor Michael Ernst on the Signedness Checker, a new verification tool for preventing signedness errors in numerical computations in Java that is part of UW CSE’s Checker Framework. He recently earned third place in the student research competition at FSE 2016. Yazdani is collaborating with professor Ras Bodik on the development of a synthesis engine to enable the high-performance layout of large-scale data visualizations. He is working toward degrees in Computer Science and Mathematics, after which he plans to pursue a Ph.D. and an academic research career. Yazdani was profiled as an undergraduate research leader by the UW’s Undergraduate Research Program. Yu, who is studying Computer Science, International Studies, and Economics, is a research assistant in the Information & Communication Technology for Development (ICTD) Lab led by professor Richard Anderson. She has been working alongside Ph.D. students Sam Castle and Fahad Pervaiz in the lab’s Digital Financial Services Research Group to address security and usability challenges for digital banking in the developing world, including a study of mobile money markets in Ghana. Last spring, Yu was named a member of the inaugural class of the Husky 100. All three students earned Honorable Mentions in the competition, which is designed to highlight exceptional potential among the rising generation of computer scientists. UW CSE students’ success over the years in the CRA awards is evidence of our commitment to providing our undergrads with a first-rate educational experience, including opportunities to participate in hands-on research alongside our faculty, Ph.D. students, and postdocs.